On a beautiful summer day in June 2013, Carol Enns experienced devastating injuries in a motor vehicle accident involving a drunk driver north of Colville, WA. Carol was a long time member of the Smokette's Women's hockey team, and living the physically active life that so many of us enjoy in the Kootenays. 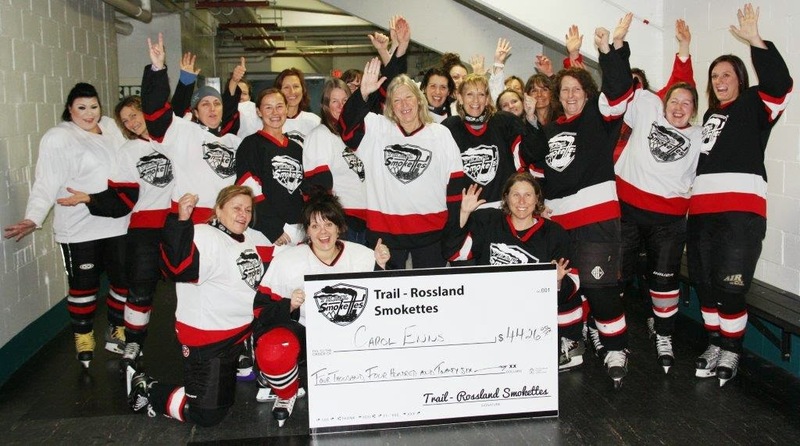 In February 2014, the Smokette's held their annual Rossland Round-Up Charitable Hockey tournament. To support our teammate, the Smokette's focused on Carol as our main recipient of charitable funds from the tournament. 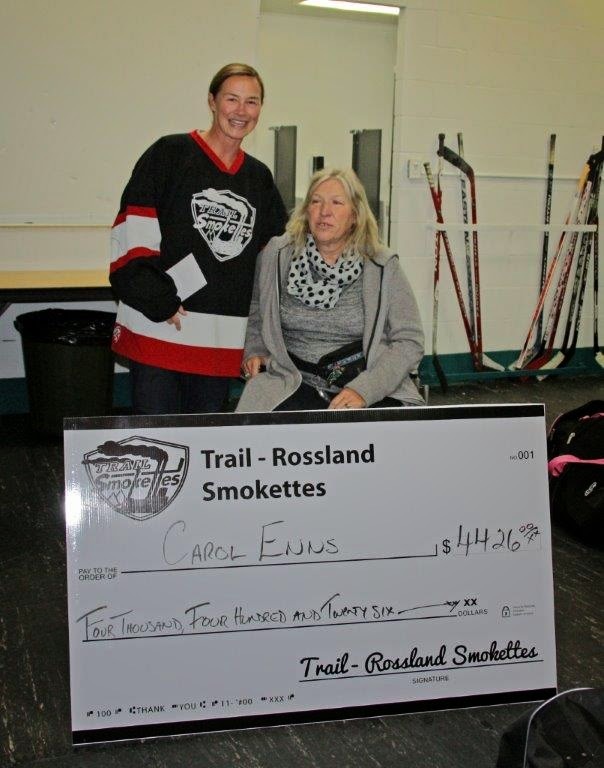 On October 30th, 2014, the Smokette's were honoured to present Carol with a cheque for $4426.00. 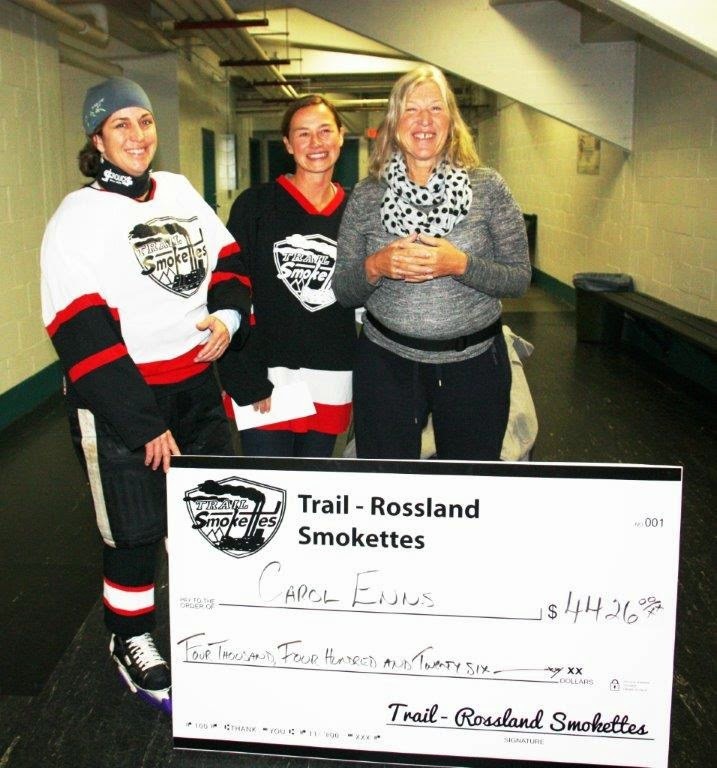 The Smokette's would like to thank their direct sponsors, Teck Metals, Nelson & District Credit Union, and Kootenay Savings Credit Union, along with all the local businesses in Rossland and Trail who provided donations for door prizes and raffles, and helped the Smokette's make a difference in our community again this year. It has been decided that our Christmas Party will be on Dec 20th after our Rossland ice time. We are working on cancelling the Cougars that day and looking into renting the lounge for afterwards. More details to follow as decision are made. Former Smokettes are welcome to this ice so please spread the word. Please add to your schedule for Saturday November 29th (for those of you not in Grand Forks) that we are having the Wildcats on our ice. Female buddies are welcome. Hey ladies we are slated to play Nelson Drillers in the old civic arena this Friday night from 9-10pm, so hopefully we fill a few cars and head over... maybe some dinner in Nelson before?? If you did not get the Doodle link please e-mail trailsmokettes@gmail.com and I will send it to you. It was decided at the AGM that we need to address the inventory of our jerseys and perhaps purchase more if need be. It was also decided that we hold a $100 jersey deposit from each player until the jerseys are returned at the end of the season (see AGM minutes posted on the Smokettes website). Of course, if you would like to purchase your set of jerseys, you need only pay $100 and they’re yours! Carolyn will be collecting either $100 cash, or a $100 cheque (post-dated to April 15, 2015) from each player at our practices in the coming weeks. The money/cheques will be returned at the end of the season when you turn your jerseys in – it’s that easy! Also, there was mention of Smokette socks (these look especially nice in team photos, and when we play tournaments). Black socks with a thick white stripe (bordered by narrow red stripes) are available at Gericks in Trail. The sooner we can collect the deposits and straighten out the jersey inventory, the better! We have received two invitations: Sicamous and Calgary. If you are keen and think you can get enough people to go please start organizing. Hockey season has started and we are in the planning stages of our Annual Easter Hockey Tournament. This tournament has been taking place since 2001. We are trying very hard this year to reintroduce a ladies division back into the tournament. Should you have any questions please contact myself. Here’s to a great hockey season. We hope your team will consider our tournament. Here is a Tournament Invitation for our 2015 Spring Event. We are now over half sold out. Feel free to send me an email if you have any questions or concerns. Thank you and have a great season. The ladies side of the Kalso tournament has been cancelled for 2014. 1) Our ice on Saturday is not longer skills training with Rob, he is unable to attend. When it is decided what is happening the calendar will be updated. This will be our 3 rd year ( under new organizers) if we go this year we get into the tournament next year for FREE!! We miss we loose out. Large room booked at Kaslo Motel.